Written on October 25, 2008 at 7:46 pm by Air Coole VW Love! Step by step instructions on how to perform valve adjustments in an air cooled VW engine. Maintaining proper valve adjustment will help your air cooled engine to run smoother and more efficient. Improper valve clearances are one of the primary core causes of mechanical and efficiency problems in air cooled engines. Due to the nature of the air cooled engine frequent valve adjustments will have a major impact on your classic Volkswagen engine’s life and performance. If the valve clearances are too small the valves will remain open too long which will cause them to over heat. If clearances are too large the opposite will happen, the valves will stay closed too long and will interfere with the intake of fuel and exhaust of burned fuel. Either way, if your valves aren’t adjusted correctly your air cooled Volkswagen will not run smoothly. Read on to learn how to adjust your own valves. On many later model Volkswagens the cylinder order is printed on the engine cover. Whether or not your VW has the cylinder order printed on the sticker you can easily determine the ordering. Stand, or imagine standing, behind your VW. The cylinders are numbered from front to back on all air cooled VW engines. The cylinder nearest the passenger side back seat is Number 1. Cylinder Number 2 is directly behind it and nearest the passenger side rear. Cylinder 3 is in the front on the left (drivers side) and 4 is behind it. The engine must be completely cool when checking and adjusting valves. 1. Disconnect the positive battery cable to help avoid accidents; Engage emergency break or chock the wheels if necessary; Put the transaxle in neutral – Be safe! 2. Take off the distributor cap and set it aside so that you can see the rotor button and the distributor rim. 3. The engine needs to be turned so that the appropriate piston is at top dead center (TDC). Using a wrench or socket turn the crankshaft pulley clockwise until the rotor button is pointing at the mark in the distributor rim. Now look down at the timing mark on the pulley, it should be aligned with the seem of the crank case. With your engine in this position the number 1 cylinder is at TDC and both intake and exhaust valves are closed. 4. Remove the cylinder valve cover by inserting a large screwdriver or similar tool into the wire bail and prying upwards. Be careful not to bend the cover or make any dings in the cylinder head rim. Try wiggling the pair of rocker arms toward the front of the engine, on your right as you are facing the cylinder head. The rocker arms should have some clearance. Believe it or not experienced air cooled engine mechanics can tell right here whether or not the valve clearances are correct. 5. Insert the appropriate feeler gauge in between each valve stem and it’s adjusting screw. If the blade slides in and out smoothly or with just a slight tug your valves are adjusted properly. If a valve needs to be adjusted first loosen the locknut then turn the adjusting screw while rechecking the clearance. The trick is to get the locknut tightened back down without altering the valve clearance. Be sure to verify the clearance once a locknut is tightened and readjust if needed. Now you are ready to go on to cylinder number 2. Rotate the crankshaft so that the rotor button rotates counterclockwise until the button is pointed 90 degrees from the mark in the distributor rim. Cylinder 2 is now at TDC. For cylinders 3 and 4 just repeat the steps, each time rotating the rotor button counterclockwise an additional 90 degrees. 6. Before replacing the valve covers inspect the rocker arms and the oil as well as the rim of the cylinder head. If there are any pieces of gasket material stuck to the head it will need to be cleaned off. Also inspect the inside of your valve covers. Once everything is clean reinstall the valve covers, preferably with new gaskets. Air Coole VW Love! 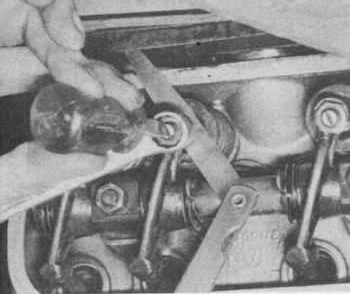 tagged this post with: Valve Adjustment Read 13 articles by Air Coole VW Love! I have always changed my own oil and plugs but until now I never really thought about adjusting my own valves. Now I am actually excited to try it out. You say turn the crankshaft 90 degrees? Everybody else I’ve seen on the internet says 180 degrees. Are you certain? The proper gap setting depends upon which engine you have. This can vary usually from 0.004 to 0.012. What type of air cooled VW do you own? admin, I would like to point out that the comment by William Shepard has caused you to make a correction that is unneeded and untrue. Your text was correct as written before you changed it. You are correctly describing the procedure using the rotor to orient yourself. Working backward, each cylinder in order would be properly located by moving the rotor 90deg. each time. William was correctly siting the crank pully method where each 90 deg. turn of the rotor translates into 180 deg. on the crank pully. So in order to be correct you would need to return the 180 deg. part in step 5 back to 90 deg. Hey Luke, I will try to get that info on the site for you by next weekend. Hi I was told to start at tdc and adjust intake on 1 intake and exhaust on 2 and intake on 3. rotate 360 degrees and adjust the rest. Is this a short cut to doing each cylinder individually? after adjusting the valves will you have play on the other valves? If my distributor and my notch for TDC donot come together , does that mean my distributor drive gear is not in correctlly? very helpful instructions-- although I’m confused as to which valves are intake and exhaust. I have a 74 transporter, 1.8 manual 4 cyl. Is the intake/exhaust order (from passenger front to passenger back and driver front to driver rear): intake-exhaust-intake-eshaust? or exhaust-intake-intake-exhaust? This matters because the manual tells me that intake should have a .008 gap and the exhaust a .012 gap. Very informative site iundeed. Will add you to our links page on the cvwoc blog. Wonder if you do have an RSS feed from the site? Could add that to our Squidoo page. Notice you have a page rank of zero so, like us you need more backlinks to build popularity and visitor numbers to make your hard work worthwhile. The 74 bus engine had one-year-only sodium cooled exhaust valves which needed to be adjusted to .008″ clearance. Most of these have been removed in the ensuing years due to their expense, and the replacement stainless steel valves should be adjusted to .006″ No air-cooled VW has .012″ clearances as posited above. Thank you Colin, being the second owner of this van, I guess I should know whether the valves are sodium cooled or stainless steel. I have a 1972 type 1 what should my clearances be? also i notticed there is no notch on the rim of my new distributor, could it be the wrong one??? It’s over 20 years since I last reset the valve clearances on an air cooled VW but isn’t your picture upside down?I did this for a living in the 80s and always set inlet and exhaust at 6 thou cold as recomended. .Your Beetle pic has the wrong date on it but it’s a good site ,especially the ads. “Your Beetle pic” There is no Beetle pic with a date on this post -- which one are you referring to? The ads on this site help cover the hosting and other expenses, but just barely, apologies if they bother you. I started out on a Squidoo page which gives the history of the Beetle and covers the car in sections. I noticed the black & white picture of the valves being adjusted is upside down. The photo on the Squidoo site of the Beetle states it is a 1955 model, obviously a mistake as it is one of the last ones made in 2003. I hope my comments did not offend you. Phil, no you havent offended me. I don’t own that Squidoo lens so nothing I can do about any mistakes or errors on it. Doing the best I can here and apologies for any mistakes or errors here. I am not the type to be offended when someone points out an error I have made. I appreciate your visiting this site and for any info or corrections you have. i have a 2086 cc and i have alot of fuel coming out of my number 1 exhaust. i had the valve replaced before it started and i have good compression on all cylinders. what to do? i also noticed that when i remove the 1 and 3 spark plug wires i makes no changes at idle it sounds the same. what would be the gap for my 1835 cc & I’ve an electronic distrubuter can you give me the procedure for this set up? IVE NOTICED PASS SIDE PUSH RODS RUBBIN ON TUBES RIGHT AT THE HEAD? IS THERE AN ADJUSTMENT TO STOP THIS? ONLY ON THE PASS SIDE, DRIVERSIDE RODS ARE DEAD CENTER IN THE TUBES. THE ROCKER ARM SHAFTS HAVE THE SAME SHIMS BETWEEN THE ARMS BOTH SIDES? I DO HAVE AFTERMARKET ADJ TUBES? BUT I DONT SEE THAT BEING THE PROB. ITS LIKE THE WHOLE ROCKER SHAFT IS OFF OR MOVED FOWARDS 1\8 IN. PLEASE HELP ME! THANKS. Only on pass side any answers? My question is;if my car was running fine and driving it in the freeway at 70 mph all of the sudden my car started to shake and loose power,what do i have to check first for the cause of this problem? Your engine takes 2.5 quarts of oil. That extra .5 quart of “leftover” oil? It goes into the air cleaner. Every 30,000 miles, clean the “horsehair” element in the top. Dunk the part in kerosene or TSP+hot water until clean. You will be shocked at how much gunk comes out. Give it a final dunk in kerosene, let it dry for a few hours in the warm sun and reinstall. Hello VW people, I have a 1966 VW Beetle with a 1200cc engine. Valves adjusted to .006, running rough/spluttering. Any tips? .008 or .004? Thank you.